Citizens, check out the awesome FAQs made by Reddit user /u/Obsidianpick9999 here! 1) I bought a package but I cannot get into Arena Commander. When you buy a package you also have to buy the ArCom Module Pass, this is $5.00 without tax, you don’t need to if the package has the pass in already. 2) What is Insurance and do I have to pay any extra money for it? 3) What does melting a ship do over upgrading it? Melting a ship or package gives you an amount of store credit, it means you will never have anything in that package again unless you buy it again. 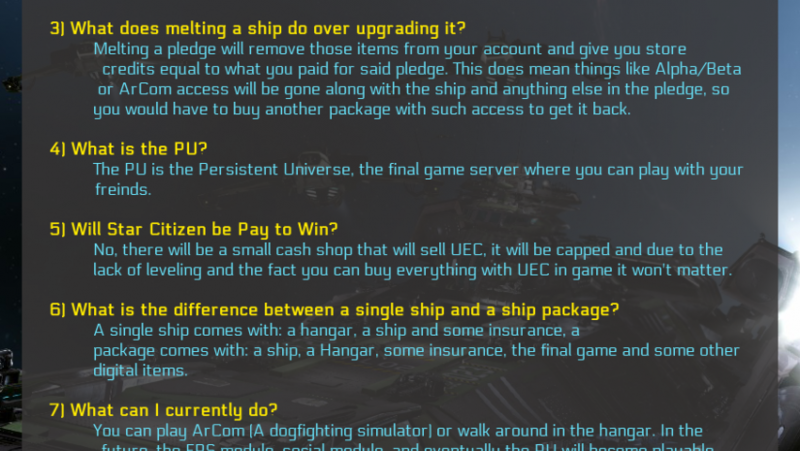 Upgrading a ship keeps all the extras in the package and you pay the difference between the ships. 4) What is the PU? The PU is the Persistent Universe, the final game server where you can play with your friends. 5) Will Star Citizen be Pay to Win? No, there will be a small cash shop that will sell UEC and cosmetic items though. 6) What is the difference between a single ship and a ship package? package comes with: a ship, a Hangar, some insurance, the final game and some other digital items. 7) What can I currently do? You can play ArCom (A dogfighting simulator) or walk around in the hangar. In the future, the FPS module, social module, and eventually the PU will become playable. You can get the game for cheaper than at release, purchase ships, and participate in the upcoming beta. 1) I bought a ship, can I fit a jump drive to it? Yes, any ship that is not a snub fighter will be able to fit a jump drive. 2) What ship should I buy? What do you want to do in Star Citizen? What is your budget? Do you want to start small or work your way up? 3) When do limited ships go on sale? At “Concept release”, when they’re Hangar ready and when they’re AC ready. More info here and in the Unofficial ship progress chart. 4) Where is my ship? Go to the “My Hangar” tab in your RSI tab, and click “configuration”, and change your hangar to your liking. 5) I bought a cool ship in the store, but I went into the game and it wasn’t there/I couldn’t fly it. What is going on? Was I jipped? Since it takes a long and intricate process in order to create each ship for the game, many ships go on sale before they are flight ready or hangar ready. Be patient, and you will be highly rewarded with the detailed effort CIG puts into their game! 6) Why cant I target anything? It’s a bug, delete your inventory xml file in the USER folder in your Star Citizen install folder. 7) Can I take weapons from ships, then get rid of the ships and keep the weapons? No. Ships come with default weapons, and if the ship is part of a free fly promotion which ends, or you melt or upgrade it, those weapons disappear. 8) What’s the cheapest ship I can buy to get in on the Alpha/Beta? 1) Who is /u/Stupid_question_bot and why is he downvoted so much? Stupid_question_bot is a valued member of this subreddit who often goes against the general opinion so people use downvoting incorrectly as an ‘I disagree’ option. Years1hundred is a youtuber who posts awesome content that is often featured by CIG, he is also a co-founder and director of video of Relay. (imperialnews.network) Made the ‘Imagine’ fan trailer. Fiendishfeather is a user who creates and posts awesome CryEngine videos. CombustibleProps is a user who 3d prints the FPS weapons and armour.